This blog is shut down for now. We now have... 48 lb. 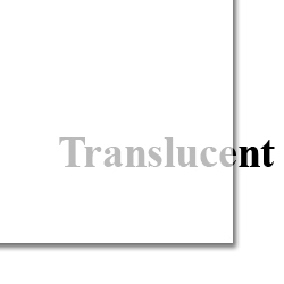 Clear Translucent Vellum - aka Pergamano Parchment. This is what the manufacturer says about this vellum: The heaviest of the text weights, any heavier and it would be considered a cardstock! 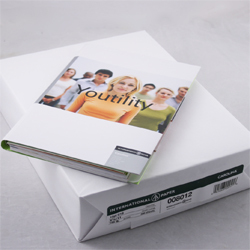 Excellent for two sided printing and multiple paged brochures. This is what I use with my Pergamano Parchment crafting. 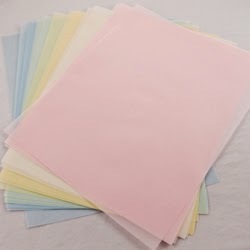 8-1/2 x 11" one sheet in each of the 5 colors: pink, peach, yellow, green and blue. Weight is 27 lb., text weight. It is a bit heavier than your everyday copy paper, and is comparable to the clear vellum I have gotten at Hobby Lobby. 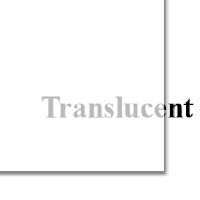 Clear Translucent Vellum 29 lb. - 8-1/2" x 11"
Just arrived . . . Guinea Feathers and Peacock Feathers! Natural Guinea Hen feathers feature a spotted tip and solid color body. 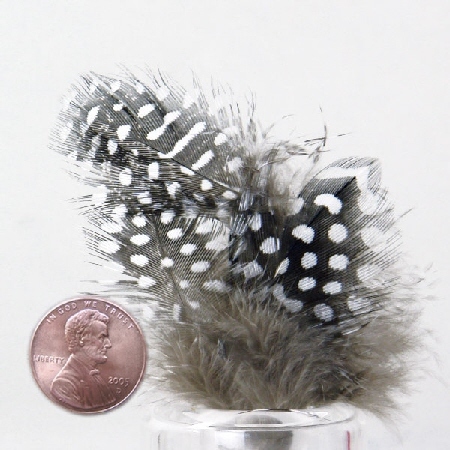 Each feather measures about 2 to 4" long x 1" wide though each feather varies in size due to the natural state of the product. 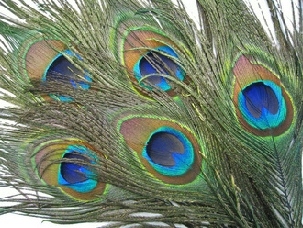 10 individual, large, extremely beautiful natural iridescent Peacock feathers with complete tails and large eye markings. The length of these feathers is 10-12 inches long and the eye width range from 1-1/2 to 2 inches wide. These peacock tail feathers are easily cut for projects requiring only the peacock eye. 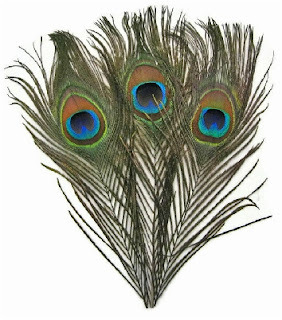 Peacock feathers are very popular and sought after because of their beautiful markings on the feathers. Use these amazing natural peacock tail feathers for your scrapbooking and card-making. They are also perfect for a peacock theme wedding or party! All feathers are natural, so feathers vary widely in shape and sizes. These peacock eye feathers are hand picked and in great condition. Shipping is $12.00 to $18.00 in USA, depending on distance. Shipping quote will be given at time of order. I will confirm availability, and give you a price quote for shipping charges and when item will ship. When I receive your approval, you will receive a PayPal invoice; after payment your item will ship. Note: For custom orders, a small deposit will be required before work can begin. I am now selling custom sport wreaths, as well as Christmas wreaths. I have the materials to make Chicago Cubs, San Francisco Giants, NY Yankees, Indianapolis Colts, and Oakland Raiders wreaths in either the Candy Cane or Round style (see the Indianapolis Colt's samples below.) I can make any team, even many of the college football teams but they can take 2 to 3 weeks after ordering. Shipping charges are between $10 and $15, depending on what state you are shipping to. At this time, I am only shipping within the USA. I will give you a shipping quote before you place the order. Shipping is via USPS. If you have any questions, please feel free to ask. Colts Candy Cane Wreath - Christmas special price: (just reduced) $25.00 - $15.00, plus $8.00 shipping within the USA. Materials used: metal wire frame base, NFL licensed Colts ribbon, deluxe mesh ribbon, wired ribbon, blue and white mini football, blue and white decorations. Size: approximately 21" x 15"
Ships within one business day of payment through PayPal. Dallas Cowboys Candy Cane Wreath - Christmas special price: $25.00 - $12.00, plus $8.00 shipping within the USA. Materials used: metal wire frame base, deluxe mesh ribbon, NFL licensed ribbon, wired ribbon, silver and blue mini football silver decorations. Colts round wreath $69.00 $45.00, plus $10.00 shipping in the United States. Materials: metal wire frame base, deluxe mesh, ribbon, NFL licensed Colts helmets, NFL licensed Colts buttons, NFL licensed Colts metal license plate, rubber footballs, football ornaments, felt Christmas stocking. Size: approximately 25" x 25" not including stocking. Materials: metal wire frame base, deluxe mesh, ribbon, NFL licensed Colts helmets, NFL licensed Colts magnet, rubber footballs, metal jingle bells. Size: approximately 16" x 28" including bells. Materials used: metal wire candy cane frame base, deluxe mesh, ribbon, MLB licensed Chicago Cubs World Series Champions magnet, MLB licensed Chicago Cubs World Series Champions buttons, MLB licensed Chicago Cubs logos, MLB licensed rubber baseballs, ornaments, blue metal bells. Size: approximately 17" x 28" including bells. Materials used: metal wire frame base, deluxe mesh, sisal mesh, ribbon, MLB licensed Chicago Cubs World Series Champions magnet, MLB licensed Chicago Cubs World Series Champions button, MLB licensed Chicago Cubs logos, MLB licensed rubber baseballs. Size: approximately 22" x 22"
Materials used: metal wire frame base, deluxe mesh ribbon, NFL licensed ribbon, wired ribbon, grosgrain and chiffon ribbon, NFL licensed Raiders sticker, silver and black mini football (hard to see in photo but it's at the top of the bow,) silver ornament/decorations. Size: approximately 21" x 14"
*I have the materials on hand to make this wreath for the Dallas Cowboys, Indianapolis Colts, Pittsburgh Steelers, Chicago Cubs, SF Giants, St. Louis Cardinals, NY Yankees, Oakland A's, and Cincinnati Reds. I can do almost any team, even some of the college football teams. This wreath can be ordered and will be as close to the picture as possible, but each wreath is unique and placement of the decorations will not be exactly as pictured. Materials: metal wire frame base, deluxe mesh, ribbon, NFL licensed Raiders buttons, 7" plastic silver and black football football in center, ornaments. Size: approximately 21" x 21" - not including bells. This wreath can be ordered and will be as close to the picture as possible, but each wreath is unique and placement of the decorations may vary slightly. Materials: metal wire frame base, deluxe mesh, deluxe ribbon, ornaments, metal jingle bells. Size: approximately 25" x 25"
Materials: metal wire frame base, deluxe mesh, deluxe ribbon, handpainted wooden eyes, felt nose, vinyl mouth, styrofoam hat, floral pick. Size: approximately 24" x 30"
Handmade -This wreath can be ordered and will be as close to the picture as possible, but each wreath is unique and placement of the ornaments/decorations will not be exactly as pictured. Materials: metal wire frame base, ribbon, lace, ornaments, metal jingle bells, silk flowers. Size: approximately 19" x 19"
Size: approximately 24" x 24"
deluxe mesh, deluxe ribbon, ornaments, artificial greenery. Size: approximately 17" x 26"
Materials: metal wire frame base, deluxe mesh, deluxe ribbon, ornaments. Materials: metal wire frame base, deluxe mesh, ornaments. $45.00 $15.00 shipping in 48 states is $10.00 for this wreath. Materials: metal wire frame, deluxe deco mesh, gold poinsettias, ornaments, metal jingle bell. Pine and Gold Christmas Wreath - $59.00 $29.95 including shipping in 48 states. Materials: metal wire frame, artificial pine garland, ornaments, jingle bells, gold bird, pinecones, gold floral spray. Size: approximately 22" x 22"
Coming soon . . . Valentine wreaths and sports heart wreaths. Flat Rate: $2.95 - for all orders weighing 5 ounces or less. (This would be approximately 36 to 40 packages of flatback pearls or rhinestones.) When I receive your order I will notify you if this shipping rate applies before issuing your invoice. *For packages weighing over the maximum weight of 13 ounces, allowed for First Class mail, please request an exact quote for shipping. 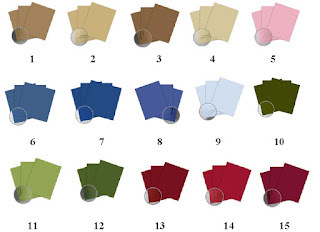 This is two cardstocks laminated together, one side which is colored with a light shade and a darker shade of the same color is on the other side. You get two beautiful cardstock colors on one sheet of cardstock. Each side carries the same textured emboss pattern and when you tear the sheet you get a gorgeous two toned deckle edge. Perfect for all scrapbooking and paper crafting projects. Great cardstock for card base. Heavy weight cardstock. This beautiful semi-glossy card stock makes a perfect base for your greeting cards. For all of you crafters with the bigger machines. . . Grand Calibur, Big Shot Pro, etc., you can now make those bigger cards. .. even up to a 7" x 7" square card! 48 lb. 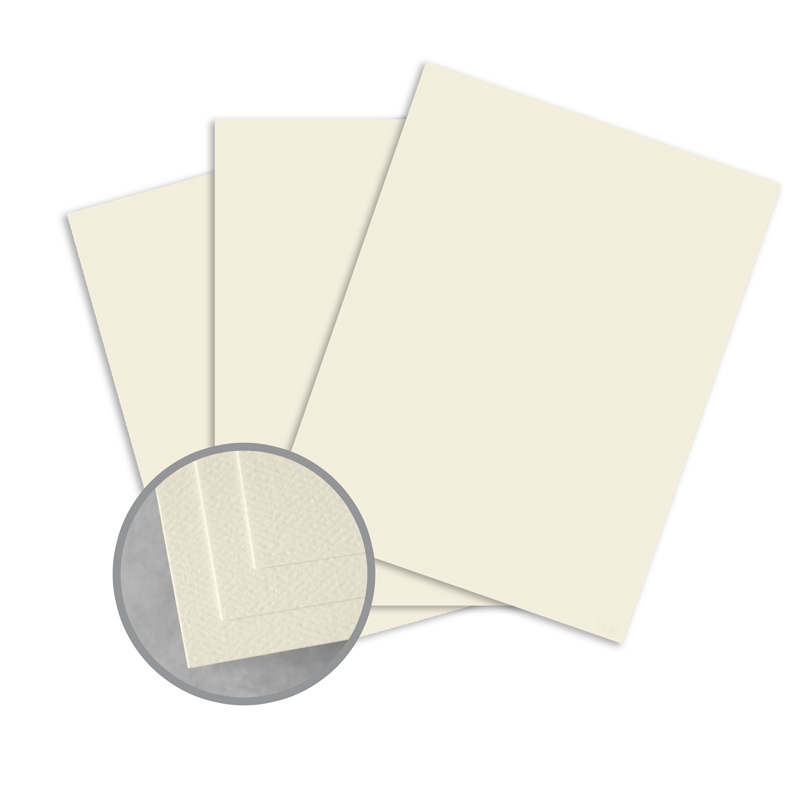 Clear Translucent Vellum - aka Pergamano Parchment. Wedding rings in Yellow Gold tone, or Silver tone (White Gold tone). With all the weddings coming up, these are great to add to your card or project. The rings are open slightly which will allow you to link them, then just twist gently to close. 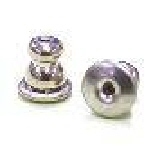 We now have the gold and silver shiny flatback pearls in 2mm. . . never have had them in 2mm before, but have had many requests for them. Clutches, Silver Tone. Now you can cover that sharp point when adding a stick pin to your cards or projects. 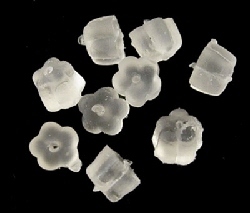 5mm long x 5mm wide, with a 1mm hole. 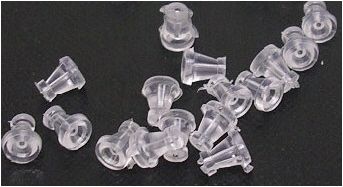 #CLCP-30 - Clear Plastic Clutches for stick pins, 5mm long x 4mm wide, with a 1mm hole. #CLCB-40 - Plastic Cube Clutches for stick pins, 4mm wide x 2.5 mm long, with a 1mm hole. 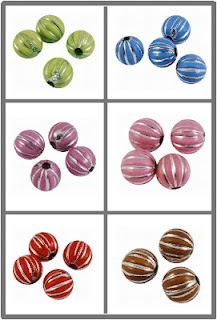 Colorful Acrylic Beads, Oval, Faceted, 8mm (slightly over 1/4" long.) with 2mm hole. Assorted mixed package. Acrylic Beads, Round, Metal Enlaced, 6mm with 1mm hole.